The Office of Industry Analysis provides information and analysis pertaining to issues affecting U.S. industry competitiveness. It’s been said before that exporting has been a bright spot in an otherwise gloomy economic outlook. However, trends are improving in important areas such as manufacturing employment and productivity. Manufacturing is seeing a resurgence in investment and hiring. The average annual productivity in manufacturing grew 2.8 percent from 2010 to 2011. Also, while the manufacturing unemployment rate was 9.9 percent in January, 2011, by January, 2012, it had dropped to 8.4 percent. Beyond what’s on the domestic horizon, more U.S. subsidiaries of foreign countries are also bringing manufacturing and jobs to the U.S., contributing to the export boom. This past year saw a number of key records set and overall export growth on track to double exports by 2014. For the first time, total exports exceeded $2 trillion, $2.1 trillion to be exact. 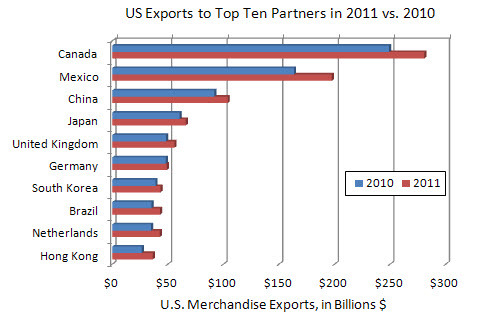 U.S. merchandise exports increased $202 billion to a record $1.48 trillion from 2010 to 2011. Exports of petroleum and coal products jumped $40 billion, to a record $101 billion from 2010 to 2011. The increase in these products accounted for one-fifth of the $202 billion national increase. Looking more closely at categories that had some of the strongest growth we see records set in nearly every major manufacturing category. Industrial supplies represented the largest goods export category (end-use) for the U.S. with a record $499.5 billion worth of exports in 2011, followed by capital goods (a record $491.4 billion); consumer goods (a record $176.3 billion); automotive vehicles and parts (a record $132.5 billion); foods, feeds and beverages (a record $126.1 billion); and other goods ($54.9 billion). Exports of services were also record-breaking, as was the overall surplus the U.S. enjoys in the services trade balance. The services trade surplus reached $179 billion, up 22.8 percent from the $145.8 billion surplus in 2010. The U.S. showed large surpluses in royalties and license fees ($84.1 billion), other private services ($80.3 billion) and travel ($36.4 billion). It stands to reason that while the nation as a whole set records for exports, most states also saw growth in their exports to the world. Thirty-six states experienced double-digit merchandise export growth in 2011; 23 states exceeded the national average of 16 percent growth for merchandise exports. Texas accounted for 21% of the nation’s increase in merchandise exports from 2010 to 2011. Texas, California, Illinois, Louisiana, and New York accounted for close to one-half of the increase in goods exports from 2010-2011. Some of the states that saw the largest percentage growth in exports last year include West Virginia, Utah, New Mexico and Nevada. Merchandise exports to some of our largest trading partners also grew to record-setting heights last year. Our exports to Mexico, The Netherlands, Australia and Brazil grew more than 20 percent from 2010. U.S. merchandise exports were also at record levels to all of the priority emerging markets under the President’s National Export Initiative, including China, Brazil, India, Turkey, Colombia, Saudi Arabia, Indonesia, South Africa, and Vietnam. Our export growth will continue as U.S. businesses find new markets and new partners and expand on the current partnerships they’ve already established.